The pool is an excellent place to spend your summers. There’s the sun, the toys and the refreshing drinks with the tiny little umbrellas. 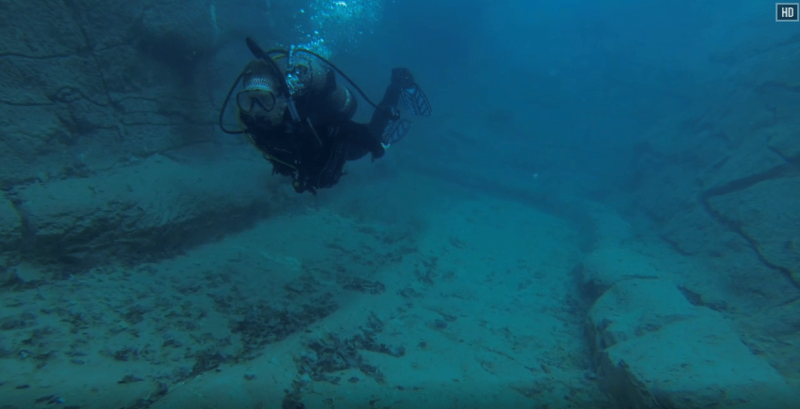 Oh, and lest we forget — the water! However, pools can also be dangerous for our dogs. Not all dogs are good swimmers and some breeds like the bulldogmay even drown if left unsupervised around a pool. Here are five great tips to help prevent such a tragedy from happening to your dog. When possible, train your dog to swim. Not comfortable with such a task? Enlist the help of a dog trainer. They are more than equipped to handle your pooch’s fear of water and teach him or her a few swimming basics. Life vests and life jackets are perfect for the dog that will never be a great swimmer. 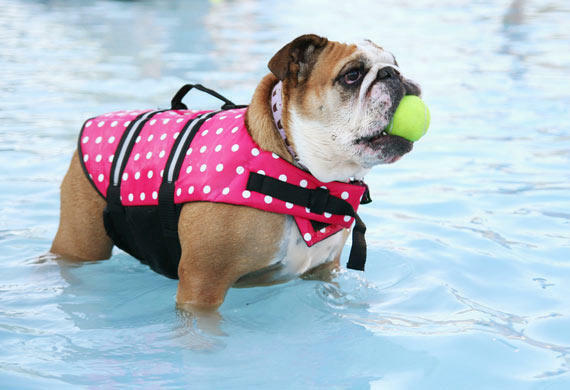 They provide extra buoyancy and a dash of bright colors so that your dog can stay afloat and remain highly visible. 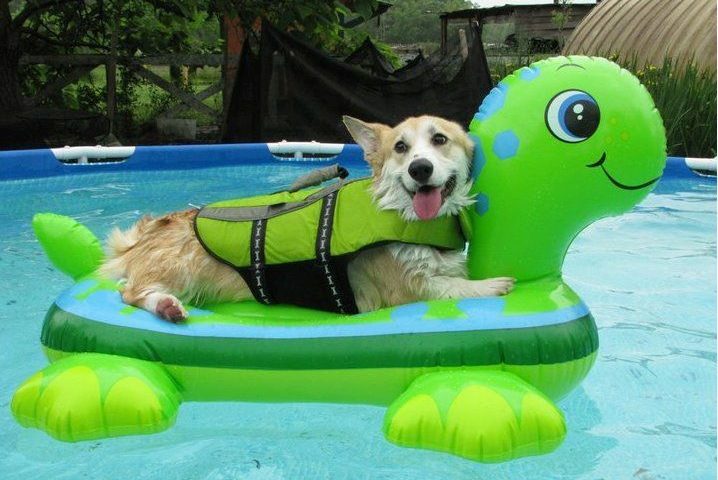 Just don’t rely on the life vest so much that you leave your dog unattended. 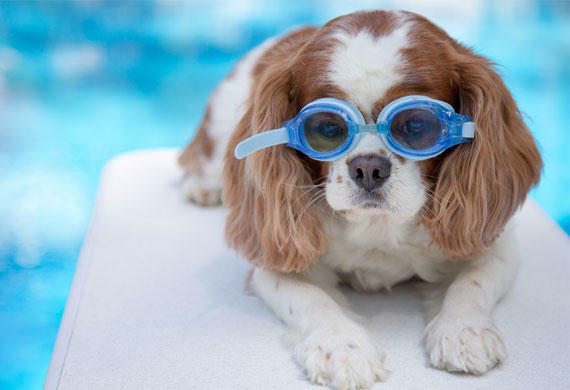 Senior dogs are more likely to suffer from arthritis, vision loss, seizures and a host of other health issues that may require your special attention around the pool or prohibit them from swimming altogether. 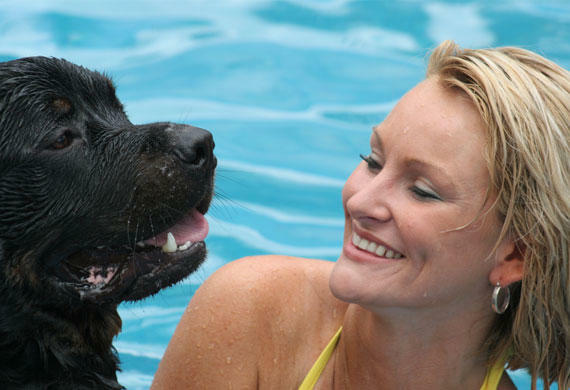 Confirm with your veterinarian if your dog is healthy enough to swim in the pool. Being able to properly administer artificial respiration and CPR on a dog is vital should your dog accidentally drown in your pool. Some animal organizations and shelters even offer classes on the proper techniques. A pool fence or enclosure is a great option if you are unable to supervise a dog that spends most, if not all, his or her time in the backyard. 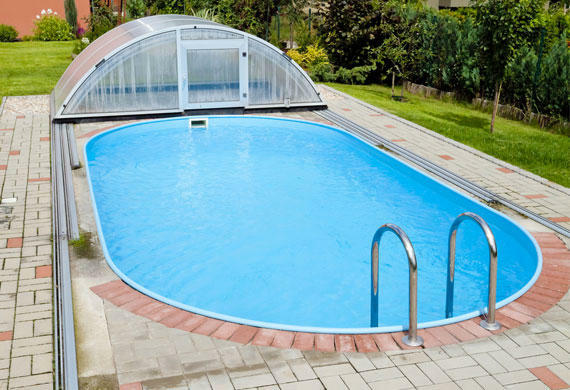 Not a big fan of enclosing your pool with unseemly posts and metal bars? Consider using an “invisible” fence. Invisible, or underground, fencing enables you to keep your pool looking spectacular without sacrificing your dog’s safety. We found this great story from petmed.com. 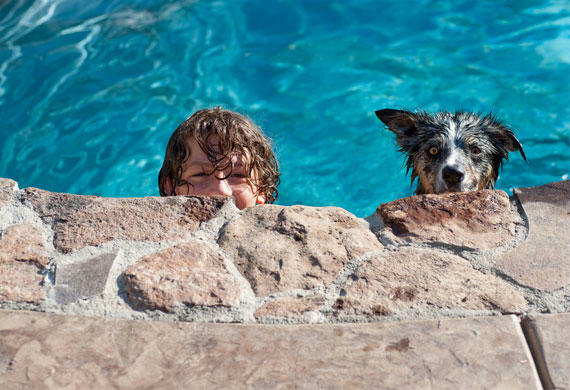 Tell us about your pet and how he/she loves or doesn’t love the pool. Enjoy the sun, it’s out and it’s hot!